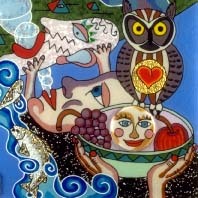 Fusing Frit Imagery with Richard La Londe (A Three Day Workshop)This is an ambitious workshop!Explore ways to create imagery in your fusing projects with frit!Richard La Londe is known for his brightly colored images drawn with crushed glass and fused into murals and vessels. Students will warm up their design ideas with “touch drawing” monoprints on paper. We will then work with ” crystal clear sheet, crushed glass frit mixtures, a liquid glass line, multiple firings, and using various techniques that La Londe has developed, create three 9″ x 9″ tiles and a 7″ x 7″ bowl. 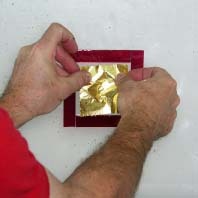 We will also construct wall mounting systems for two of the tiles. 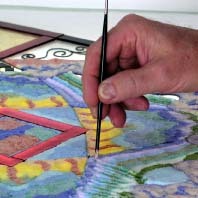 Demonstrations, firing schedules, and slide shows will roundout this workshop. 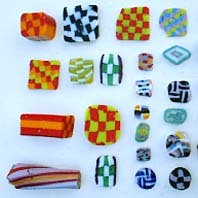 This is an opportunity to study and interact with a pioneer in glass fusing. Precious Metal Leaf with Richard La Londe (One Day – Limit 8 Students)In this workshop you will learn how to apply gold and silver leaf to your projects and how to fuse gold and silver foils.You will adhere gold foil to glass and etch a design into it, then cover this with a piece of clear glass, apply more gold and silver foil to the top surface and fire the tile.Students will also sandblast a design into another glass tile and apply gold leaf to the surface and also leaf the back of the tile. Techniques will be demonstrated, glass, leaf, foil, and special tools will be supplied.